MJR! Water Diversion - MJR! By Russ | On Sunday, May 2, 2010 Nick (USMC 0369), Tom (Black & Tan TJ) and myself (Russ Chung) started at the west end of 3N93. Our first project was to divert the water so that it would not run down the trail through the west rock garden. 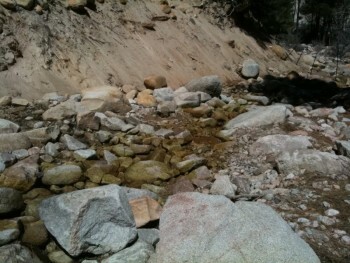 A picture of the water running down the trail taken during the April 25 work day follows. We cleared a channel near the top of the rock garden to divert the water from the trail. The water diversion had an immediate, dramatic effect on the amount of water running through the rock garden. This picture was taken from the same spot as the previous week after we diverted the water (follows). After completing the water diversion, we continued up the trail, trimming brush for about a mile until we ran out of time.